Your Mount Union education begins with our high-quality academic curriculum, featuring an array of majors in Engineering and the sciences. Supported by a world-class faculty, you’ll forge an intellectual foundation for lifelong learning and success. A Mount Union education prepares you for today’s realities and tomorrow’s challenges by linking classroom instruction with practical application. Live what you learn—and build valuable career skills—through a full range of experiential learning opportunities. The result is your own Mount Union experience: relevant, dynamic...exceptional. Our more than 18,000 alumni worldwide stand as proof that a Mount Union education is a worthwhile investment. In fact, among members of the 2017 graduating class, 93%* of those self-reporting had started a professional position, were accepted to graduate school, or were pursuing continuing education, all in an average of 2.6 months after graduation. It doesn’t get much more convincing than that. Don’t let concerns about the cost of college keep you from exploring this exceptional investment in your future. Our tuition is 11% below the average cost of other similar private institutions in Ohio, and we were recently named a “Tuition Hero” for our efforts to keep tuition increases to a minimum. In addition, 99% of undergraduate students receive some form of financial aid, and our average financial aid package is $26,172. * Statistics based upon survey results, with 71% of the Class of 2017 self-reporting. 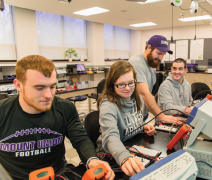 Why Engineering at Mount Union? Mount Union offers undergraduate Engineering degrees in Biomedical, Civil, Computer, Electrical, and Mechanical Engineering. The Department of Engineering distinguishes itself by supplementing its curriculum with the Four Pillars of Exceptional Engineering Education—hands-on, real-world engineering; an international engineering field experience; the integration of engineering knowledge with essential business skills; and the building of effective leaders and communicators. Our Civil Engineering degree will expose you to community-based engineering, which will allow you to work on projects with local and international communities. A strong focus in math and science and depth in technology are integrated into classroom studies to make you a creative and innovative problem solver. Our Mechanical Engineering degreeprovides the academic foundation and career preparation for a rewardingcareer in this field. You will develop the critical-thinking skills to solve complex problems, understand how things work in the world, and createthe next technology innovations to help society. Biomedical engineers are integral in the development and innovation of equipment, devices, and computer systems and software in the health care field. Our Biomedical Engineeringdegree integrates engineering principles and design concepts with medical and biological sciences to advance health care treatment. You will foster an innovative mindset while developing the knowledge necessary tomake a successful impact in this rewarding and high-growth field. Computer engineers are continuously making computing systems faster,smaller, more reliable, and more mobile. 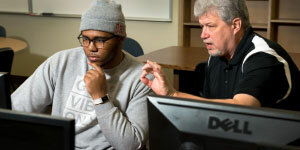 Our Computer Engineering degree integrates electrical engineering and computer science to design, build, and test computing systems. You will develop the innovative mindset and crucial knowledge to successfully impact this rewarding andhigh-paying field. Electrical engineers are at the forefront of all electronic systems. Our Electrical Engineering degree is a broad discipline that permeates every aspect ofour lives ranging from electricity to telecommunications. You will develop the crucial and influential knowledge to impact this in-demand field. At Mount Union, we offer a numberof programs in the sciences that are geared toward preparing students for career success or further study after graduation. The Biochemistry degree focuses onthe chemical and physical principles of living things and biological processes, including reproduction, growth, and disease. Our Biology degree will provide you with an understanding of life as aprocess as you gain an in-depth understanding of how external factors influence different types of organisms. Our Chemistry degree offers a wide range of fundamental knowledge in many fields of chemistry, preparing you for either a career as a professional chemist or setting a strong foundation for advanced studies such as medicine. 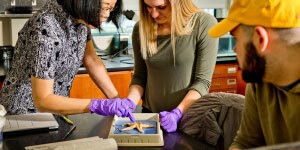 Our Environmental Science degree will expose you to in-depth scientific study. You will also explore economics, ethics, and policy, all through the lens of the environmental perspective, as you learn to solve environmental issues. Our Geology degree tackles challenging scientific problems involving theenvironment, natural resources, and man-made and natural hazards. Our Medical Laboratory Science degree explores chemistry, genetics, microbiology, and the unity and diversity oflife as you prepare for your final year in clinical training with a hospital affiliate. Our Physics degree blends theory, experimentation, and exploration as you master the fundamental principles of the subatomic and the universe to understand how they behave.